This is Part 1 of our 4-Part Series on The Same Page Team in New York City. Last Friday night, members of the Same Page Team took in a Yankee Game at the new Yankee Stadium. The Bronx Bombers were matched up against the Boston Red Sox, so we knew this was going to be a high-spirited affair. We got on the subway on the Lower East Side during a beautiful, sunny and warm day. During our northbound journey on the 4 Train towards the Bronx, something must have upset the baseball gods, because when we alighted at 161 Street, the sky had darkened and the winds had picked up considerably. Before we could even get into the stadium, the rain drops started coming down, fat and slow at first, but then suddenly in a huge downpour. We rushed our way inside, and began our long trek up the ramps towards the 400’s. Meanwhile, the game continued, and we heard the unmistakable rush of a Yankees home run (we found out later it was Nick Swisher). Upon reaching our desired section, we remained inside to avoid the rain. Lightning and thunder could be seen and heard, and yet mysteriously the game continued. Other than a brief break for the grounds crew to add some dry clay to the infield, play never stopped despite the rain. Being from Toronto and being used to the SkyDome/Rogers Centre and its marvelous retractable roof, I was not accustomed to watching baseball in the rain. However, after the second inning, the rain had stopped for good, the dark clouds had passed, and we finally reached our seats. The stadium is a marvel, and approaching it from the subway is certainly a thrilling experience. I hate the Yankees, but being a lifelong baseball fan, I can certainly appreciate the history of the Yankees organization. Think of the legendary players to have worn the pinstripes, including Babe Ruth, Joe DiMaggio, Mickey Mantle, and others. Think of the 27 World Series Championships. Much like the city of New York, the Yankees and their fans don’t really care whether you like them or hate them, but you have to respect them. 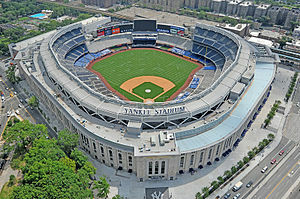 This new incarnation of Yankee Stadium was completed and opened in 2009, replacing the original Yankee Stadium, which was built in 1923. The new stadium sits across the street from the original site, which has been converted into some very high quality playing fields. 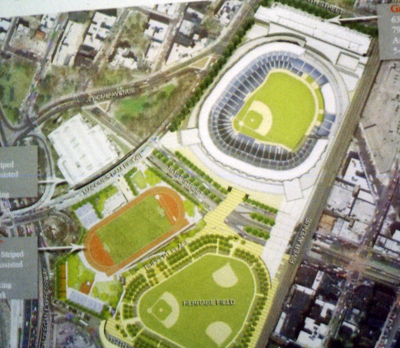 This is an excellent use of the space, I think, while the history contained in the original stadium (Monument Park, for example) was simply transferred to the new stadium site. Cheers to the planners on that one. The game was an exciting back and forth struggle. After the Yankees had taken the lead with the aforementioned Swisher home run, plus two more solo home runs in the second inning from Curtis Granderson and Russell Martin (CANADIAN! ), the Red Sox stormed back to take a 4-3 lead in the third inning via Dustin Pedroia’s 3-run blast. We knew we were in for a barnburner. In the fifth inning, Yankees living legend Derek Jeter hit a home run to tie the game, and the stadium exploded with cheers. Perhaps no player in any city is as well regarded as Jeter is in New York, and it showed when he hit a blast to left field. Incidentally, it was his 250th career home run. An instant momentum shift, and even though the game was still tied, somehow you just knew that the Yankees were going to win this one. 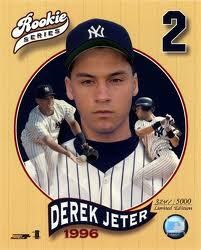 Boston looked deflated, and the Yankees, through their 38-year-old captain, had just sprung to life. And so it went. The Yanks scored another run in each of the sixth and seventh innings, and ultimately, came away with a 6-4 victory over their fiercest rivals. Beer and food prices I found to be on par with other stadiums I have been to, such as Fenway Park and the Rogers Centre. I treated myself to a famous “Nathan’s” Frankfurter, and several beers. The hot dog was decent, but the concession stand had run out of ketchup, so I only had mustard on it (champagne problems, I know). I found the Yankee fans to be generally well behaved, despite what you may have heard. We were not dressed in support of either team, and therefore were not subject to any barbs, but even Red Sox supporters in our section were mostly left alone to wallow in their own misery. It seemed that rather than start a conflict or show anyone up, most fans were there simply to enjoy the game and the great season their team is having. All told, our trip to Yankee Stadium was a positive experience. Though we could have done without two innings of thunderstorms; once those had cleared up, we had a great time. 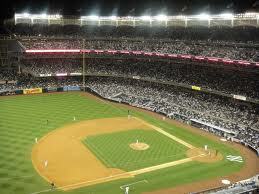 Taking in a game at Yankee Stadium is a great idea for any upcoming trip to New York. Check back tomorrow for Part 2 of our 4-part series on The Same Page Team in New York City.